Help full staff. Great location and very calming. The compliments in the executive rooms were a nice touch. There were very comfortable sleeping pillows. The easy access from main road and easy public transportation to and from the city center was positive. The hotel had good parking and the city views from high floor rooms towards the city side of the hotel were amazing. Location was good, but as we wasted a lot of time dealing with check in issues, we missed the event we were trying to get to that evening so the location was irrelevant. The pool is great, and the hotel provides you with towels and bathrobe. They also include some water and drinks included for you. The room was great. We also use the bus line to go to downtown, a direct bus no. 3. it was really convenient. comfort , easy reach to every floor with 3 big elevators. The view of rooms with river-view wad good. fast check in check out. Nice lobby & area for walking or cycling. The room was very nice and the bed very comfortable. We had a restful day and the next day continued on our trip through Germany. Breakfast was excellent. Rooms were large and comfortable. Being objective, the taxi that rescued us was very nice. The airco was great, as well as the bath, pool and an awesome sauna. The staff was very friendly. We especially liked when the cleaning staff reacted very professional and mellow to a little accident we had in our room. Also, the bar was a lot of fun (perhaps a bit too fun...) and it had a nice sports bar around the corner. It's likely we might return one day. The value we got for the money we paid was awesome. Holiday Inn Hamburg This rating is a reflection of how the property compares to the industry standard when it comes to price, facilities and services available. It's based on a self-evaluation by the property. Use this rating to help choose your stay! The Holiday Inn Hamburg has bright rooms with a variety of international satellite TV channels and free soft drinks from the mini-bar. Free Wi-Fi is available in all areas. The hotel has 2 towers, one for the standard rooms and one for the higher-category rooms. 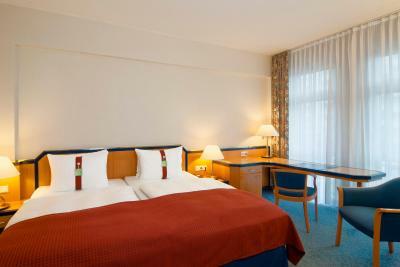 When would you like to stay at Holiday Inn Hamburg? Bright room features floor-to-ceiling windows, a satellite TV and modern bathroom with toiletries. Private parking is available on site (reservation is not needed) and costs EUR 19.50 per day. Bright suite features floor-to-ceiling windows, a flat-screen TV and modern bathroom with toiletries. Extra space and separate living and sleeping areas are provided in this comfortable suite. House Rules Holiday Inn Hamburg takes special requests – add in the next step! Holiday Inn Hamburg accepts these cards and reserves the right to temporarily hold an amount prior to arrival. Reception - remember to ask about parking and need for ticket to multible entrance. Parking too expensive (19.50 euros!). Big hotel, can be very crowded. Good value for money. Great view! Public transport to city center (bus) within 5 min walk. All amenities in room including tea kettle and soft drinks in the fridge. Beds very comfortable. Friendly staff! They hired a nearby building and joined it to look as if it is their part. We have to change two lifts and a long walk before we can come to our room. Not good. If we can stay at other building ourselves, it would be half the costs. There was no good breakfast same menu for all days. Better soundproofing of windows, especially since the hotel is situated next to a heavy traffic main road. The beds were a bit too hard. The room door had a big gap below it allowing more sound from corridor to enter room.